This snapshot summary of Improving the Lives of LGBT Older Adults summarizes the full report and its recommendations in capsule form. Social stigma and unequal laws make it harder for lesbian, gay, bisexual and transgender (LGBT) elders to achieve three key elements of successful aging: financial security, good health and healthcare, and social support and community engagement. The snapshot report succinctly summarizes the unique challenges and inequities facing LGBT elders and offers high-level recommendations for eliminating — or at least reducing — inequities and improving the lives, and life chances, of LGBT older Americans. Movement Advancement Project and SAGE. March 2010. Improving the Lives of LGBT Older Adults. 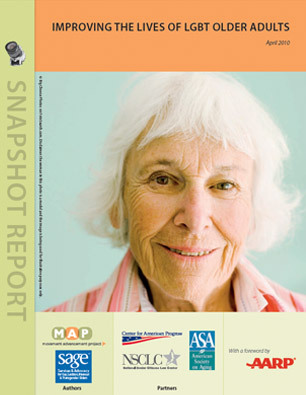 http://www.lgbtmap.org/improving-the-lives-of-lgbt-older-adults (date of access).